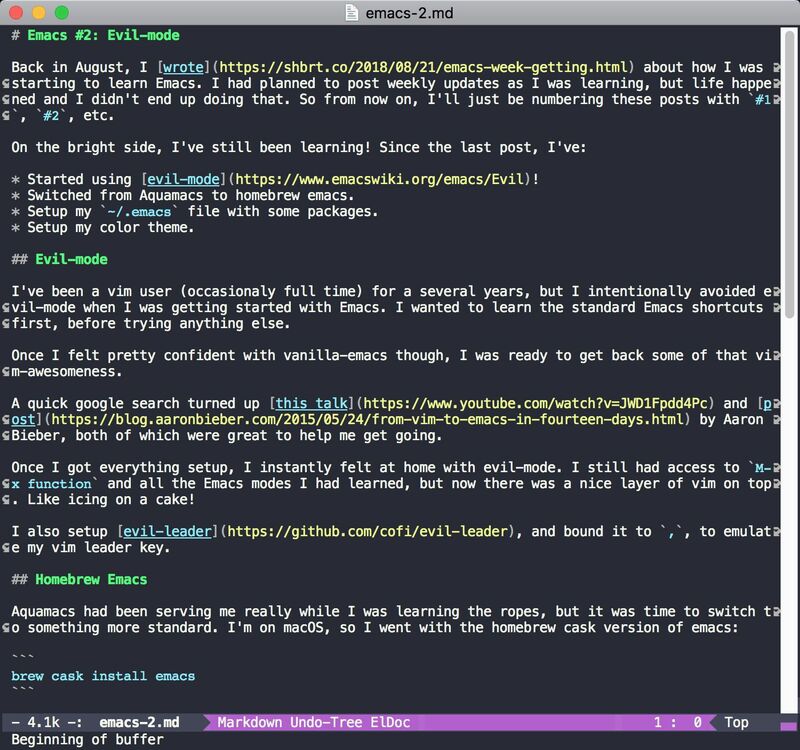 Back in August, I wrote about how I was starting to learn Emacs. I had planned to post weekly updates as I was learning, but life happened and I didn’t end up doing that. So from now on, I’ll just be numbering these posts with #1, #2, etc. Switched from Aquamacs to homebrew emacs. Setup my ~/.emacs file with some packages. I’ve been a vim user (occasionaly full time) for a several years, but I intentionally avoided evil-mode when I was getting started with Emacs. I wanted to learn the standard Emacs shortcuts first, before trying anything else. Once I felt pretty confident with vanilla-emacs though, I was ready to get back some of that vim-awesomeness. A quick google search turned up this talk and post by Aaron Bieber, both of which were great to help me get going. I also setup evil-leader, and bound it to ,, to emulate my vim leader key. Now that I needed to install and configure plugins, I figured it was time to setup my ~/.emacs file. In Aaron Bieber’s post he recommends use-package for auto-installing packages. It sounded similar to how I was using Vundle in vim, so I went with that. Once I had use-package installed, I added in a couple of packages like powerline and markdown-mode to try it out. I stole some keyboard shortcuts and configurations from Aaron Bieber’s dotfiles. Thanks Aaron! I updated my karabiner config to allow caps-lock to function as both escape and left-control. I ran into an issue with the powerline separators being the wrong color, that required a special setting to fix. I’m still really glad I started out with Aquamacs. It was easy to install, and behaved more like a standard macOS application which made it easy to get going. Now that I can install fancy packages, I added Dracula theme for some pretty colors. I also really like having powerline in the bottom.